Have you spent any time on Goodreads, the big reader site? I’ve been building a platform there for a few months, but haven’t written about it yet. Goodreads is a great place to meet people who love books, and love to talk about them. Since most self-published authors are also avid readers, it serves us both ways. You can get great recommendations on books or take part in discussions. Reader communities like Goodreads are one of the least utilized but fastest-growing resources online, and that’s very exciting for self-publishers. As authors, Goodreads also allows you to post an Author page and there are many ways you can use the community and the tools there to create interesting in your books. The site is so rich, it can take a while to explore. That’s one of the reasons I was very interested in a webinar that Joan Stewart, The Publicity Hound, just ran. Last month I gave a presentation with Joan at the IBPA Publishing University, and I was impressed with her experience at helping authors succeed. I learned a lot from her, and last week Joan interviewed me for a blog post about Goodreads. But Joan’s webinar went way, way beyond just an introduction to Goodreads. I’ve just finished looking through the webinar and the slides Joan used, and I have to say this is one of the most comprehensive, yet streamlined presentations I’ve seen. A 6-page PDF that brings together all the links you’ll need to check out all the resources, over 50 links in all. This PDF alone could have saved me hours of hunting. Like a lot of other authors, I find the most valuable part of a learning experience like this one is the time you can save. Sure, I’m pretty good at research, and I could find a lot of this stuff on my own. But what is it worth to have reliable info gathered in one place? And Joan shows how to get started right away, so there’s no lag between learning and doing. If you want to find your market online, locate reviewers, and understand how to get lots of people to notice and pay attention to your book, this is something you should check out. Here’s the link to the article again, click the green banner ad at the bottom of my interview for the page that tells you about the webinar. As always, I’m interested in what you think and whether this is helpful for you, so let me know in the comments. Photo by the author. This is an affiliate promotion and if you purchase a webinar from Joan, I will receive part of the fee as a commission. Goodreads has a poorly designed web site and I ought to know. That’s what I dd for a living of 30 years of which the last 23 years was with Caterpillar Inc that sends me my retirement benefits every month. I wouldn’t be getting them if I didn’t know my stuff. In addition, those (registered) three letters after my name adds further credability. Google those letters to read of my credentials. As I see designed application, I often use this example to get my point across by comparing a house’s feature to that of a computer’s features. As to the house, you’re instructed to go into your garage to one of three cabinets there that has all kinds of associated yard tools which make sense that that is the right place for them. However in the same garage in the middle cabinet on its bottom shelf of five shelves is a metal box. In the box is your toothbrush. Each time you need to brush your teeth, instead of going to the normal place, your bathroom, to fetch your toothbrush, you have instead to go to the garage and remember which cabinet and which of its shelves and the box to get your toothbrush. More times than not Goodreads has their stuff in the wrong place. I clicked on one of your affiliate links above (every little bit helps, eh?) to the article and, alas, cannot find the green banner ad at the bottom of the interview for the page about the webinar. Sorry for the bother, Virginia. Try this link and at the bottom of the interview with moi you should see the green banner pictured above. Are the links no longer available? Excellent, it so happens I’ve just posted a piece on my webpage about social networking as I’ve experienced it on Facebook and Goodreads, where I received a little boost when I bought an ad there, last year. I’m somewhat at a loss as to how to get my webpage feed to show up on my Goodreads status update. I do the standard cut and paste on the update button, but it seems inadequate . . . and I never see my update along with my other friends’ updates. Just wanted to let authors know that I am an avid book reader (400 last year) and plan to read 450 this year. I don’t have a television (it’s very free-ing to be without). I love reading, reviewing and blogging about books to feel free to contact me. I have specific genres I will read just to let you know. Wait, I’m doing the math . . . that’s almost 9 books a week, 52 weeks a year. Wow, thanks for the note Pam, I won’t keep you because I know you’ve got a book you need to get back to. I’m an Aussie that has set up a company to resurrect out of print books and turn them into eBooks and market them online. 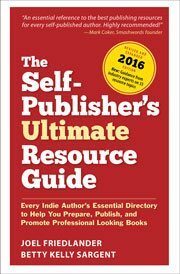 There are a handful of blogs I regularly visit about all things self-publishing and yours is top of the list. Always practical advice. Just wanted to say thanks. I look forward to having a few more ‘international’ voices at the self-publishing table in the coming years. Thanks Ben, and good luck with your project, it sounds interesting. I’m part of a great group where i do monthly challenges, and i’m excited when i eventually have a book on the market so i can have an author page and take things to the next level. Joel, during the interview, you really stopped and made me think when you said that your blog that you imported into your Goodreads profile sometimes gets more comments than this blog does. That’s pretty powerful stuff! Also, I loved your tip about making sure to dump your Twitter followers into Goodreads. Many of these people already love us! I almost never read for pleasure, but I read a lot of business books and I’m going to start commenting on them on Goodreads. Hi Joan, thanks for your comment, and don’t forget to “friend” me on Goodreads!